Who is at risk of developing cancer from talcum-based baby powder? Posted on 09/07/2018 How Quickly Can a Mass Tort Dangerous Drug Case Be Settled? The smell of baby powder may conjure peaceful memories of your child’s infancy or the relaxed feeling you have after a shower. You likely used Johnson & Johnson’s talcum-based baby powder on your child or yourself without a second thought about its safety. Now, however, reports have come out, warnings have been issued, and lawsuits have been filed alleging that talcum-based baby powder can cause cancer, and you want to know if you, or a loved one, may be at risk. The primary risk of talcum-based baby powder is that talc is contaminated with asbestos when it is mined. Asbestos is a known carcinogen. A December 2018 Reuters investigation revealed that Johnson & Johnson has known for decades that asbestos may be in its baby powder. Specifically, Reuters found that from at least 1971 through to the early 2000s, Johnson & Johnson’s baby powder sometimes tested positive for asbestos. Johnson & Johnson allegedly knew about the test results and the dangers of asbestos but failed to tell government regulators or consumers. According to the World Health Organization, and others, there is no safe level of asbestos exposure, and the American Academy of Pediatrics recommends against the use of any baby powder—whether talc-based or not—because of the potential dangers from inhalation. While the United States Food and Drug Administration (FDA) has not yet issued a warning about talcum powder and cancer, Health Canada issued a talcum powder warning in December 2018. The Canadian public health agency issued a letter to health care providers advising them to advise their patients to stop using talc in their genital areas because of the risk of ovarian cancer and to avoid breathing in talcum powder to avoid lung problems. The Canadian government is also considering further actions to restrict the use of talc. Some women who have used talcum powder in their genital areas have sued Johnson & Johnson alleging that the talcum powder they used near their vaginas traveled to their ovaries and caused ovarian cancer. Ovarian cancer can be difficult to diagnose in its early stages. This allows the disease to progress and becomes more difficult to treat. By the time many women are diagnosed with ovarian cancer it is often a stage III or IV cancer and the five-year survival rate may be 50% or less. Like ovarian cancer, mesothelioma often presents with vague symptoms or is asymptomatic in its early stages. In its later stages, mesothelioma is nearly always fatal. Lung conditions and mesothelioma may develop if talcum powder fibers that contain asbestos are inhaled. While the American Cancer Society does not yet recognize this risk from cosmetic talcum powders, a New Jersey man convinced a court that his mesothelioma was the result of using Johnson & Johnson’s baby powder and Health Canada has linked loose talc powder to decreased lung function, breathing difficulties, and fibrosis. These conditions may affect people of any gender. 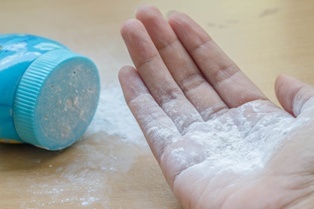 The potential dangers of talcum-based powder may impact both men and women. Anyone may be hurt, although the specific injuries that are suffered may depend on how the product was used. If you have developed ovarian cancer or a lung condition that you think might be related to your use of baby powder, then the time to act is now. Our experienced attorneys would be happy to review your case, free of charge, and to advise you about your legal options. If there is a causal connection between your cancer or lung condition and baby powder, then we will fight for your fair and just recovery. To learn more, please contact us today via this website or by phone to schedule your free consultation. How Quickly Can a Mass Tort Dangerous Drug Case Be Settled?